These mini solar system models from AstroReality pair with an augmented-reality app so users can virtually explore all eight planets of the solar system (and Pluto). Ever wish you could visit other planets in our solar system without launching on a deep-space mission? Now you can embark on an interplanetary adventure right from the palm of your hand, thanks to gorgeous, 3D-printed planet models and an augmented-reality (AR) app. 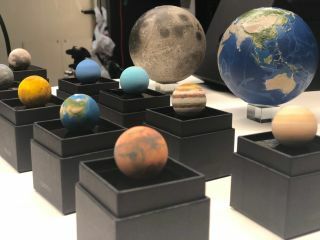 Brought to you by AstroReality, the same company that created the "Lunar" AR moon model and its new Earth counterpart, this set includes miniature models of all eight planets and one model of the dwarf planet Pluto. Each model is 1.2 inches (3 centimeters) in diameter and color-printed with a resolution of 0.1 millimeter per pixel. After calibrating the app by aligning the camera view with the virtual model of the planet (or dwarf planet), you can explore the objects up close. The app brings the models to life by showing the planets' atmospheres, moons and rings. It also features real-time data and other stats, like the object's diameter, mass and distance from the sun, as well as the length of a day and the length of a year there. "The AR visualizations are based on real-time calculations of planetary orbits," Anna Palagi, a spokesperson for AstroReality, told Space.com. "The data and images used to make these are from NASA Science Solar System Exploration," an interactive web page with real-time measurements and visualizations of solar system bodies. In the AR app, you can see the difference between daytime and nighttime as the sun illuminates half of each object and leaves the other half in the dark. Because the app operates in real time, if you're looking for a specific feature, it could be in the dark and difficult to see at the time. If that's the case, you may want to wait awhile, until that particular site has rotated into daylight. You can buy the AstroReality solar system mini set for $129 here. The minis are not sold separately. AstroReality also sells similar AR models of Earth's moon in different sizes for as little as $39, so if you're interested in trying out the app but aren't ready to spend $129, you may want to check those out first. The company also offers a cool Lunar AR notebook that contains a virtual moon AR experience and has a textured image of the moon on the cover. AstroReality's lead producer, Joanne Dai, told Space.com that the company is working on a new AR Mars model similar to the grapefruit-sized Earth model that AstroReality launched on Kickstarter this year.